September 2016 – Due to the way their fabric is designed, Siegling Transilon curved belts have exceptional longitudinal and lateral flexibility. 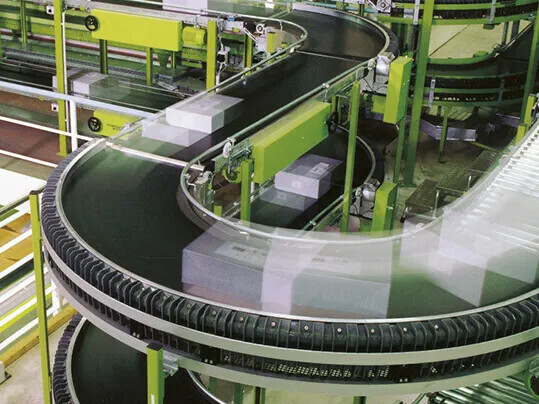 They are ideal for all belt guidance systems and used on the conveyors of many well-known manufacturers in numerous intralogistics applications, in particular in parcel and other distribution centres. The fact the curved belts are made of several segments creates good distribution of tension within the belt, so that even heavy products are conveyed reliably. Forbo Movement Systems’ new Siegling Transilon E 12/2 0/V3 MT-C black type is a new curved belt that also has an exceptionally low noise underside. Worth particular mention is the balanced ratio of longitudinal, lateral and diagonal tension in the fabric. This guarantees that no bulges occur on the outside and inside radius. Longitudinal seams and segment splices are possible in the new curved belt. Belt widths of up to 3,350mm can be supplied. Small returns of up to 30mm drum diameters are no problem.